Have you ever had one of those nightmares where you know something is chasing you, but you have no power to move or elude the inevitable terror? Now, have you ever had one of those situations that you wanted to keep going through over and over? That is what the indie horror game “Five Nights at Freddy’s” will do to you. 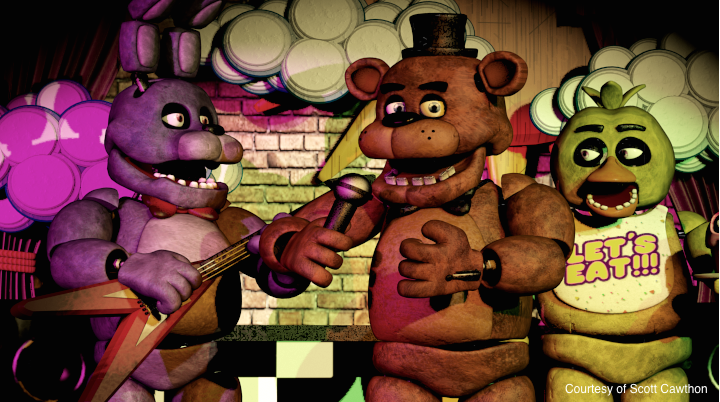 Welcome to Freddy Fazbear’s Pizza, a children’s restaurant that features animatronic animals that sing for you and have a good time. You play as the new security guard that watches over the restaurant overnight, using security cameras to keep track of every corner of the building. There’s just one slight detail that may have been left out of the job description: animatronics may actually come to life in the middle of the night and try to kill you. If you have ever had even the slightest fear of those animals at Chuck E. Cheese, this game will be a terrifying experience for you. Perhaps the scariest aspect of this game is that you cannot move around at all. You are stuck in your tiny little office all night until either that clock reaches 6 a.m., or the robots catch you and stuff your body into a Freddy Fazbear suit (which your body simply cannot fit in). Most horror games instill some kind of fear in you by making you move your character into situations you don’t want to go near. In “Five Nights at Freddy’s,” the horror is coming to you, and all you can do is sit there and watch it happen. You are given a screen to watch through all the security cameras in the restaurant to make sure every animatronic is in place. You never really see them moving around on camera; you’re just lucky if you see them standing in one place for an extended period of time. There are two blind spots for your cameras, however, and those areas happen to be right outside the two doors to your office. These areas are pitch black, and you can only see what’s hidden in them by turning on a flickering light. You do have security doors to keep these animatronics out, but you’re instructed to only close them when there is an immediate danger. Why can’t you just keep those doors closed and take a nap, you might ask? Apparently somebody at this establishment didn’t pay the electric bill, and you have a very limited amount of power to manage. Every item you use, whether it be the doors, lights or even looking through the cameras will use up your power. If you happen to run out of electricity before 6 a.m., everything shuts down and the doors stay open. You’re forced to wait in the darkness before you see Freddy’s glowing face staring at you as you hear a chilling version of the overture from “Carmen,” a popular music box song, as he waits patiently to claim you in a quick and horrifying manner. It may be a helpless feeling as you progress through the game, but somehow you want to keep trying after you’ve failed. Your main task is to survive the job five nights in a row, each night more difficult than the last. There are also some more difficult bonus nights if you beat the game, with one where you can choose how difficult each animatronic will be to keep under control. Just try to make sure none of them sneak into your office as you’re watching the cameras, or you’ll get one of the better jump scares you’ve seen in a video game once you go back to look at the door. The motto at Chuck E. Cheese may be “Where a kid can be a kid,” but the characters of Freddy Fazbear’s Pizza will make you cry like one.